This family trolley set up allows for two toddlers to sit side-by-side and is known as the twin toddler seat. Obviously useful to families with twins or those with children close in age, this is a popular setup with shoppers. 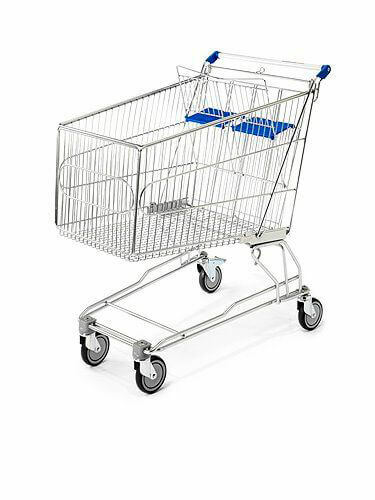 For all our family trolleys as standard we use a 210L wire shopping trolley with a braked castor. This is a large enough trolley to take the additional weight and height of the trolley without causing a concern and the addition of a braked castor enhances the safety of this trolley. We can fit the family trolley system on larger trolleys and some can fit on the 180L however we recommend the 210L as it suits each of the family trolley options.